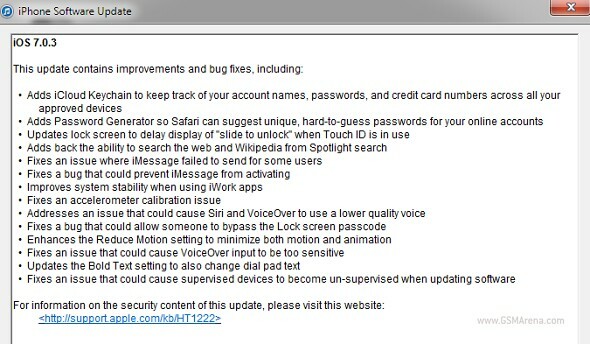 Apple has just launched the iOS 7.0.3 update for all supported iDevices. The release is rather rich in bug fixes but it also brings a few new features. As for the bugfixes, the most important ones include fixing some iMessage activation problems, and also resolving the notorious accelerometer issue and putting to sleep the recently discovered ways to bypass the Lock screen passcode (a previous bug of this kind was fixed with iOS 7.0.2, too). Here is the full changelog, in case that image up there is hard to read. Have you got your update installed already? Did it fix a nagging issue for you? Let us know in the comments below.